Last week I ended my topical coconut oil experiment and started a new skin experiment. A month ago I was poking around the Underground Wellness site when I found a post about shower filters. My first thought was skepticism. I understood why you filter drinking water, but was doubtful there were risks to city water hitting your skin in the shower. Then I researched it further and became convinced that showering in chlorinated water presented a potential health danger that was very inexpensive to eliminate. So I bought a shower filter. One of the numbers I saw in several places was that taking a 10-15 minute shower with unfiltered water was like drinking 8 cups of chlorinated water. I’m not sure about any of this. What I do know is that since moving to Ballard I can smell the chlorine in my shower. Getting a shower filter is cheap insurance. I bought a basic GE Shower filter. This is before I knew about the Vitamin C Shower Filters mentioned in Chris Kresser’s article. Amazon sells both. I was able to install it myself without any problem and no one has ever confused me with being a handyman. 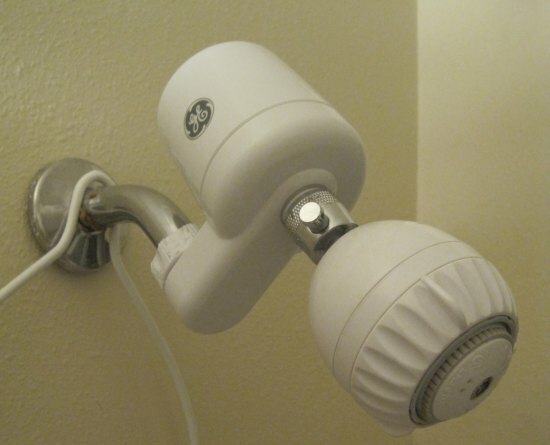 Since my showers are already very short, I’ll probably be fine with the GE model for now. The chlorine smell is gone, so I assume it is working fine. In a month or two, I’ll report back if there is a change in my skin health. Cool. I have been wanting to try one of these. BTW, made beef liver pate yesterday. It’s not as good as the chicken liver version, but I assume ultra healthy! The water feels and smells different. Pay attention to how well your soap and shampoo suds up and your skin will also be less dry. I think they are worthwhile investments. I have become a shower filter user too. I don’t remember for sure what movie it was (perhaps A Civil Action with John Travolta, maybe Erin Brokovich) where people where getting their dose of cancer causing chemicals by inhaling the atomized particles in their shower. Yuck. Chlorinated Water issue: So, all those kids on the swim team through school, college and then eventually daily lap swimmers at the Y are doomed. To be fair to Andrew Weil, he highlighted this problem many years ago… and I’ve ignored it. @Mike – I’m guessing the average pool swimmer also takes hot showers, so I’m not sure how one could study both groups to see different illness outcomes. I really wanted to dismiss this idea as fear mongering, but it is SO CHEAP that I had to try. Cheaper than a bottle of vitamins.